We’re all about improvement through innovation here at Absolute. UniBlade2’s ‘dynamic fluidics’ proves it, with higher run speeds and better-than-ever filling consistency, all thanks to the system’s carefully controlled ‘spiral’ ink flow. We worked with an expert in fluidics to redesign the wiper’s profile: nothing too radical, but the difference is clear. 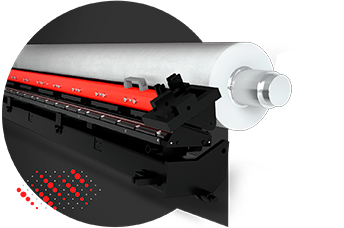 UniBlade2 uses a special curved back to create a cyclonic effect that significantly improves performance, both in terms of streamlining ink flow through the circuit and also accelerating distribution across the roller. Quickening the whole process means the ink is kept more stable and has less time to gel, and that brings one big benefit to your printing operation: longer runs with less intervention necessary. UniBlade2’s wash system is integral and automatic, so it saves crucial time between set-ups and gives you the chance to win back no-cost capacity. With downtime turned into work time, improved productivity is guaranteed, and even more so in bigger systems. Ink flows in and out smoother and faster than ever. To reduce the risk of gelling and really optimise performance, we looked closer than ever at getting higher volumes of ink more quickly into the cavity, then out again through the returns. We've achieved it with a subtle but intelligent re-design, featuring baffles and all-new 'weir stops' to tightly control ink expulsion. A carbon fibre quality that’s out of this world. Literally. There’s nothing new about carbon fibre chambers, but UniBlade2’s construction uses extruded carbon fibre for exceptional strength and a grade that’s used in aerospace engineering. Acme Corrugated Box Co. Inc.
UniBlade2 could make a huge difference to your print operation. Talk to an Absolute expert to discuss UniBlade2 for you. Alternatively, download a brochure for more information.